Surviving Michigan in the winter with little kids is tough. We end up staying inside a lot because it’s too cold to play outside. Which leaves me constantly on the lookout for fun things to do with the kids. Hudson is always always always asking for a project to do. 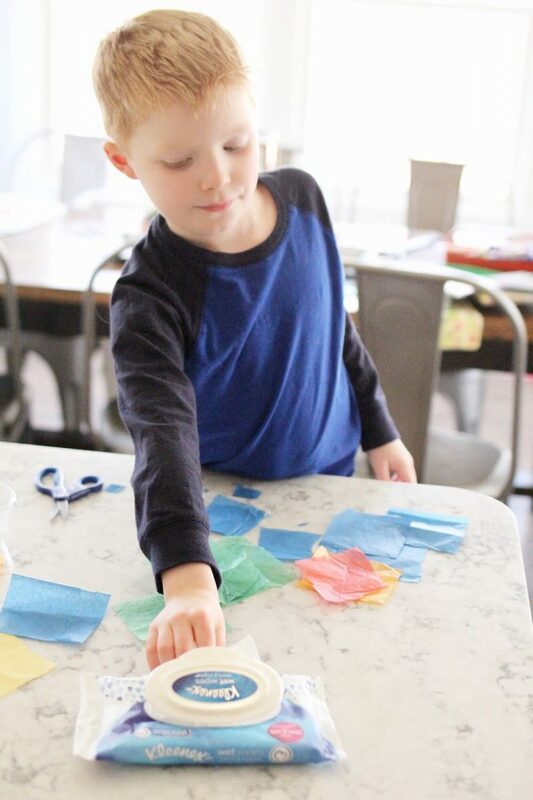 He loves crafting and creating….I think he gets that from my mom. We also love getting our hands dirty! 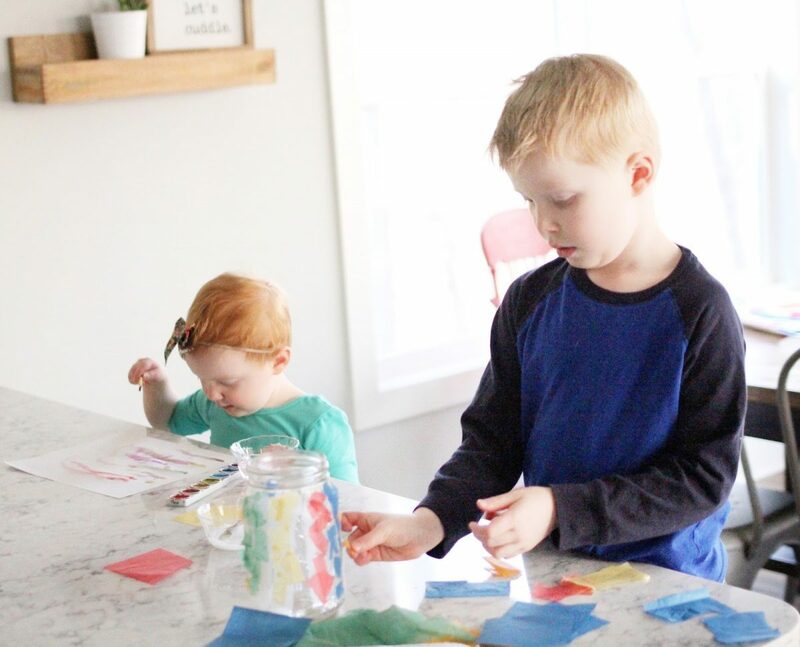 Some of our favorite things to do inside are painting (with washable paint or watercolors of course) cutting shapes, and drawing. But even those things get boring after a while. So when I came up with the idea for this project, Hudson was SO excited. 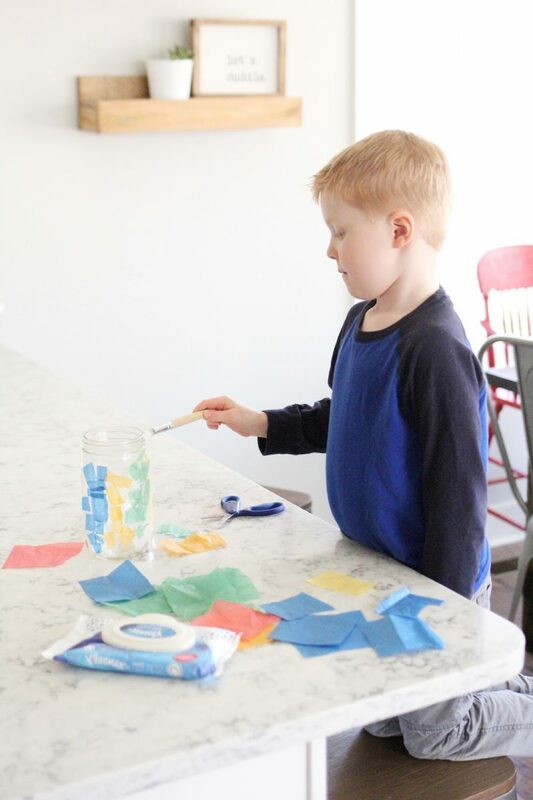 Have your child “paint” one section of their mason jar at a time with a paint brush and some glue. 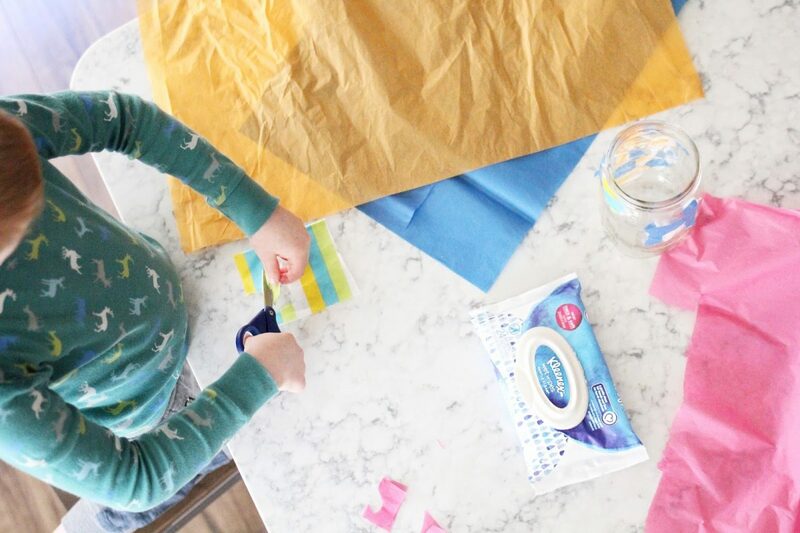 Then, have them cut out shapes using their tissue paper and scissors. Hudson is five and still learning how to use scissors. I found it easiest to cut some squares of tissue paper for him myself and then give them to him to cut out. 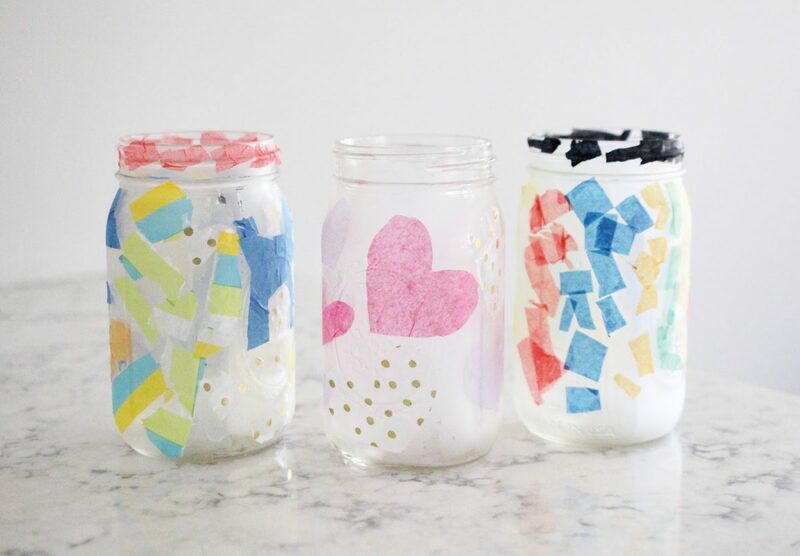 Stick the shapes on the mason jar however you would like! I think it looks pretty when you overlap the pieces…but I couldn’t get either of my kids to want to really try that. For Sadie, who’s two, I cut out tissue paper hearts for her and she stuck them on. And got tired of the project about 10 minutes in and wanted to paint with watercolors instead. Just keeping it real. It’s guaranteed with all that glue that someone will get glue on their hands. 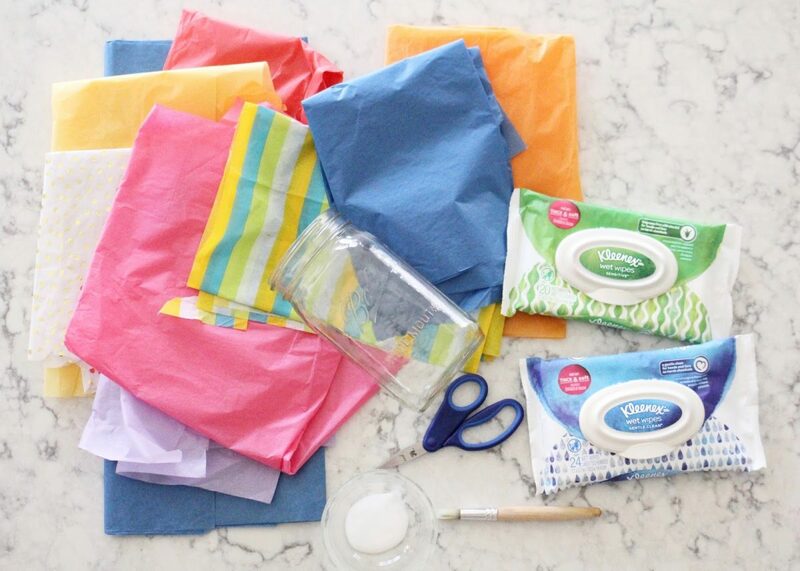 It’s really hard to cut out tissue paper with sticky fingers, so I like to keep these Kleenex Wet Wipes right next to us for quick and easy clean up. Hudson just wiped off his fingers in between cutting and gluing. 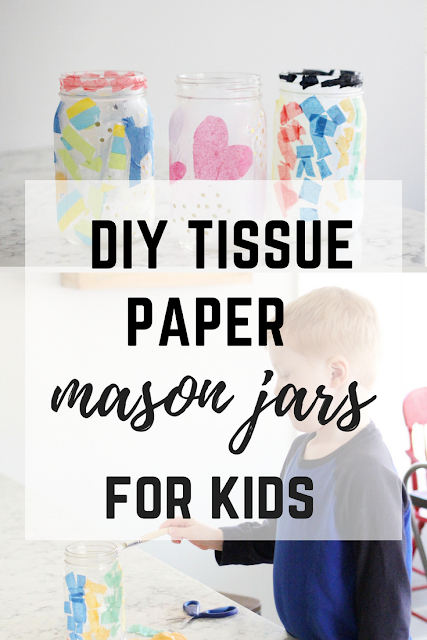 Once all of the tissue paper is on the mason jar, have your child paint a thin coat of glue all over the mason jar, sealing in their work. You can use mod podge too, I just didn’t have any on hand. Then allow it to dry over night. And that’s it! 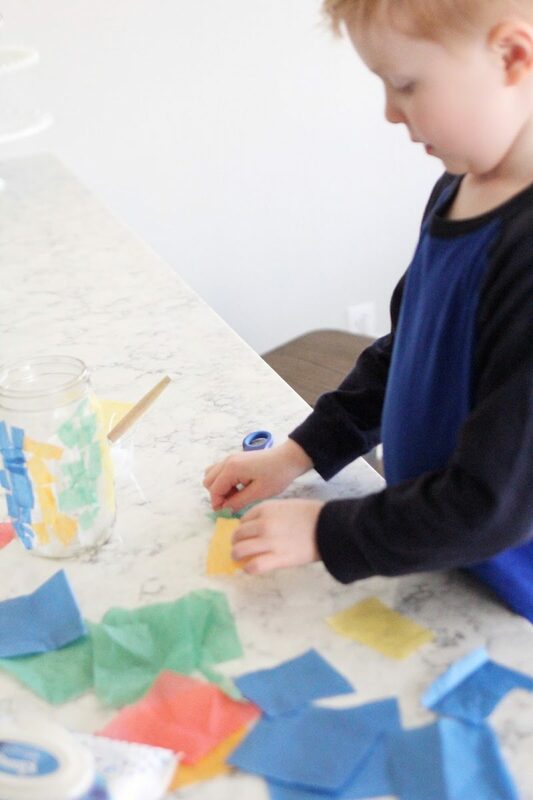 Hudson loved making his mason jar so much that he requested to make another one the next day. He’s so proud of his work. Wouldn’t these make the cutest Mother’s Day gifts? Pop some flowers or a candle in them and you’re all set! If you decide to make these make sure you work on a table or countertop where you can get a little messy, because glue will get everywhere. Obviously we aren’t afraid to get messy in our house! When I designed our kitchen I picked out our quartz countertops with our family in mind. I knew that I wanted the look of marble without all of the work….and stains! 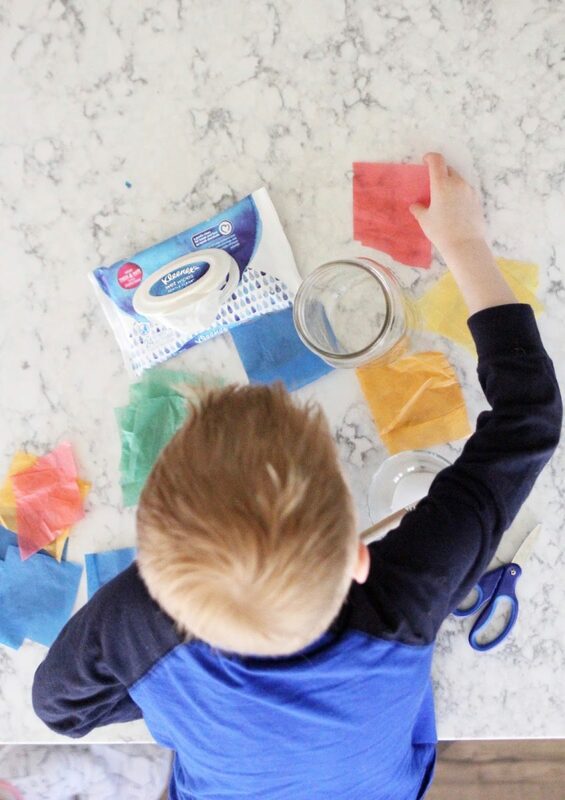 Our counter tops wipe up beautifully and hold up to even the worst messes. And with three little kids, that’s totally a must have! Another must have are Kleenex Wet Wipes! They are meant to be used every time you get messy! I love to use them on the kids’ hands and faces as a gentle, but effective, way to clean them up. I also keep a package Kleenex Wet Wipes in my purse for easy cleaning on the go. They are a total mom must-have for sticky and messy hands while we are out and about! You can find Kleenex Wet Wipes at your local Target or right here online!